One of our most popular safaris, the 4-night Thorn Tree Safari takes in classic Kenya locations including Treetops & the Masai Mara - finish your adventure with a week on the beaches of Mombasa. Fly from Heathrow to Nairobi, arriving next day. Regional departures from around the UK are also available. On arrival you’ll be met at the airport and transferred to the Safari Lounge, where you can freshen up before departing for the Aberdares (180 kms - approximately 4 hours). Arrive in time for lunch at Outspan. After lunch continue on to Treetops, the world renowned rustic tree house which is legendary for its historic royal connection. The rest of the afternoon is at leisure. Overnight: Treetops (lunch and dinner included). Drive to Lake Nakuru (180 km - approximately 4 hours). Enjoy a game drive in Lake Nakuru National Park, sanctuary to one of the largest populations of rhinos in Kenya, plus Rothschild's giraffes, leopards and lions. After lunch at Lake Nakuru Lodge, continue your journey to Lake Naivasha (80 km - approximately 2 hours), where over 450 species of birds have been recorded. Overnight: Lake Naivasha Country Club (breakfast, lunch and dinner included). 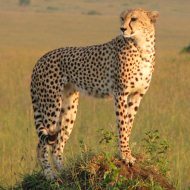 Drive to the magnificent Masai Mara (270 km - approximately 5 hours 30 minutes), home to countless animal species including the 'big five' and a multitude of plains game. Lunch at your lodge followed by an afternoon game drive. Overnight: Keekorok Lodge (breakfast, lunch and dinner included). Enjoy an early morning game drive on the Masai Mara with further opportunities to see the superb wildlife, followed by breakfast at the lodge, or take an early morning balloon flight over the Mara followed by a 'bubbly' bush breakfast (optional extra). A second game drive will take place in the late afternoon. Overnight: Keekorok Lodge (breakfast, lunch and dinner included). Return to Nairobi by road (300 km - approximately 6 hours), or optional extra fly from the Masai Mara to Nairobi. Transfer to Nairobi airport for your flight to Mombasa. You’ll be met on arrival and transferred to the Southern Palms Beach Resort. Spend the next week relaxing on the beach. Return transfer to the airport for your flight back to the UK.